A very old picture of Monlam at Bodhgaya. I took it out from my archive of memories from college days..
What we realized was .. how we were worlds apart when it came to Eating and FOOD. He was this disciplined skinny vegeterian kid who ate in moderation and I was the the girl who loved eating meat especially chicken kebab & ate anything I laid my eyes on. He tried to instill his discipline in me which I tried to follow but.. not for long… Often times, my friends would laugh at me and say, “ hahaha… Chime, can’t believe you are actually listening to somebody for a change”… I would put my head down and say,“ donno… for how long though…” Sure enough, it didn’t last for more than few days and I bet, he realized what a stubborn girl I was. Anyways…..long story – short fast forward, all the episodes in between… We moved on with our lives and barely met each other since we starting living in different cities . However we continued to keep in touch virtually every now and then. I didn’t see him for years, until recently when I went to Bodhgaya(Bihar, India) for the Kalachakra 2012(http://www.facebook.com/Kalachakra2012). Not sure if its our karma or coincidence because we definitely didn’t plan to meet. I had just reached Gaya and was suppose to meet my dad however, in all that chaos( there were around 200,000 people from around the world , who had come to attend the Kalachakra teaching) I couldn’t find him (dad hates cellphone and refuses to keep one) and it was getting dark. I was at my wits end as it was my first visit to Bihar and didn’t have a clue or knew anyone from this place. I frantically looked around hoping to find a familiar face and it was like as if someone heard my silent cry. 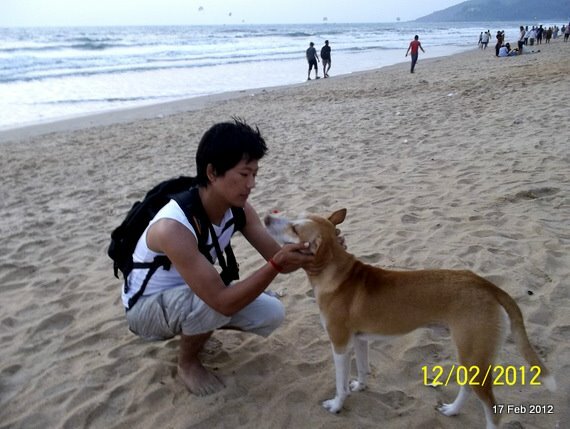 I saw the posters of TVA( Tibetan Volunteers for Animals) in the distance and ran towards it. 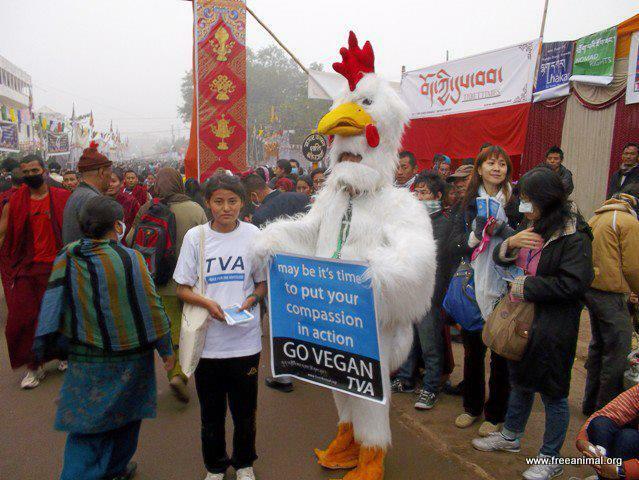 Chicken Mascot by TVA at Bodhgaya during Kalachakra 2012. I knew… He got to be here… My face lit up with joy and I felt an instant boost of energy. I went to the registration tent and asked for Lobsang Monlam and where he is staying. 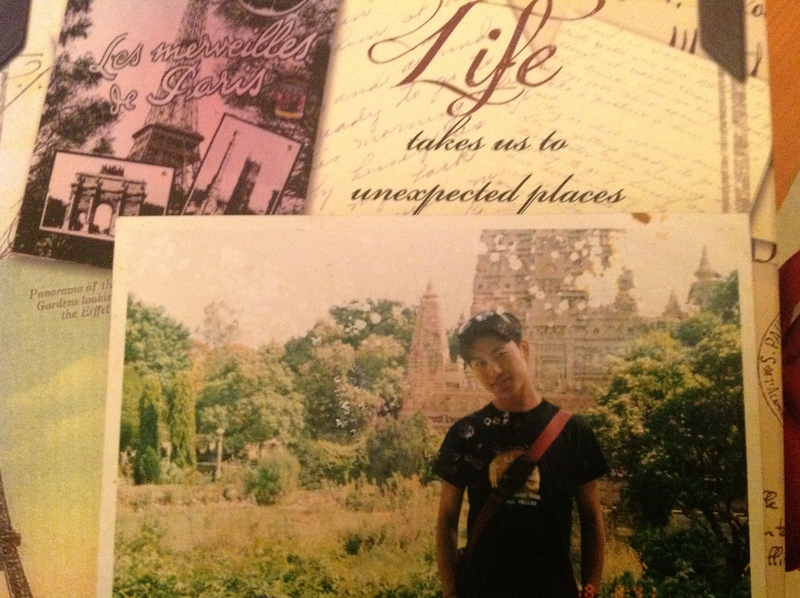 They didn’t have a clue as Tibetans usually have the same name so.. they asked me… if I could give more details abt this friend of mine.. I mentioned that he is the Director of TVA and then all the guys at the tent said in unison.. “ALEEEY…. Monlam….! !” and quickly wrote down his tent number . 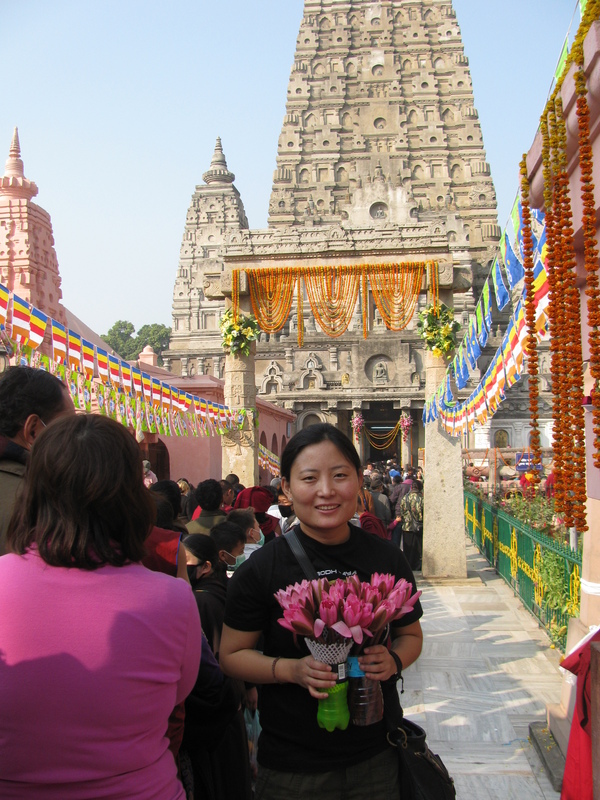 Me at Bodhgaya in Jan,2012. When I got back to the States after my vacation, I didn’t feel like eating meat anymore. However, I didn’t make any promise because, I know… i have broken them many times in the past so.. just went with the flow.. It wasn’t until,today,when I turned the pages of the calender to Sept that I realized that its been 8 months since I have turned vegetarian. Looking back , I know that .. this wouldn’t have been possible if it wasn’t for the constant update that I see from TVA on facebook about how we should live and let live the animals too.Each time, I see Monlam’s name or the TVA post on facebook, its a constant reminder about the truth that I try to run away from or turn a deaf ear to, due to my own selfish desire to satisfy my need first . Th truth that animals are sentient beings and not a food choice, that they too desire nd hence deserve to live on this planet just as we do, this and definitely the Kalacharka teaching by Dalai Lama which encourages us to be vegetarian has helped me achieve the goal that I have not achieved for the last 3 decades. I want to take this moment to thank my friend MONLAM for the positive influence in my life and for being sucha caring soul to the animals and being the voice for the voiceless.For those of you who wish to make the compassionate choice but have been struggling .. I would encourage you to join TVA if not physically atleast virtually on Facebook and of course send a friend request to Lobsang Monlam who will be happy to asssit you through this journey. For more details & if you wish to follow TVA… click on the below link. ← Maria Michta&Chime’s – Meet & Greet Moment at Astor Place. Nice article – though i don’t think I”ll ever manage going veg 🙂 keep it going !! thank you chimmie for listening to your heart!! and for doing the right thing.. this was such a treat.. enjoyed reading every word 🙂 Memories, frenship, nostalgia.. cheers!! The World is Vegan! if you want it. Inspirational! Thanks for sharing your life story. It will definitely inspire others as well. I am glad you liked it. Thanks for your comment. Hey chime , that was a great read ! I totally enjoyed the genuineness, the honesty and the innocence of your writing. Kudos to your success in staying vegan for 8 long months. Believe me you did not missed a thing! There r great recipes out there for vegetarian. I advise my patient to decrease their consumption of meat if they can’t stop completely and I am trying to practice my own preaching …I admire people who have soft spot for animals … So thank you Monlam, may god give you the strength and thank you chime for bringing the topic back to live …. Dr Tsewang – U know, I feel extremely proud to put the word”Dr” in front of your name coz, I know how hard you have worked for it. CHEERS to that first!!! Its beautiful.. I hope i find someone like Monlam to make me go veggie..